What better companion, during these times of quaking anxiety, than the oracle of urban-meets-suburban agita, David Byrne? On his first true solo album in 14 years, the quixotically-christened American Utopia, Byrne has a lot on his mind — and while he's not feeling very positive, he's not steeped in gloom either. Yes, there's a particular political bogeyman that partly served as Byrne's catalyst, but the portrait rendered here isn't of an individual or government, but the country itself. Over the course of ten crackling songs, Byrne lays out a jigsaw puzzle of the jagged American psyche: discordant, rambunctious, unpredictable, despairing and, fleetingly, a kind of Eden too. Byrne has always been attuned to post-modern neuroses, deftly intuiting the panic roiling below the surface of ordinary lives — or extraordinary ones, as he's more recently explored via theatre productions (with grandiose figureheads) like the Imelda Marcos bio-musical Here Lies Love, co-written with Fatboy Slim's Norman Cook, and Joan of Arc: Into the Fire. Byrne is an ambitious collaborator too, which has kept him busy, working over the past decade with St. Vincent (2012's Love This Giant), Caetano Veloso, an array of Color Guard enthusiasts (like Tune-Yards' Merrill Garbus), and his nearly-forever friend Brian Eno, who also figured in the nascent stages of American Utopia's birth and shares co-writing credit with Byrne on the bulk of the album's songs. Fifty seconds into "Dance Like This," American Utopia's lead-off track, Byrne sends up a bright flare for anyone listening: expect the unexpected. The song's tender, piano-brushed melody shockingly swerves, erupting with a gnashing metallic bridge, as if hijacked by Trent Reznor and Blade Runner's Roy Batty. Teetering between a croon and a threat, it's a startling preamble to American Utopia's surreal road trip, lyrically strewn with chickens and elephants perusing newspapers (the effusively chatty "Everyday is a Miracle"), yearning questions ("It's Not Dark Up Here"), and the ruminations of the blithely wealthy ("Doing the Right Thing"). An exhalation of sitar spurs on the dubby shuffle of "Gasoline and Dirty Sheets," a refugee's bemused take on American capitolism, while the clattering, jazzy, funked-up "Everybody's Coming To My House" is a spirited dance banger for dystopian times. Byrne lunges for the highest reaches of his vocal register on the latter, his voice strained with brittle desperation, like a man who really doesn't want anyone at his house at all. Musically, American Utopia is a bricolage of constantly moving (and grooving) parts, constructed by Byrne in an atypical way, via so-called "song grids" and more. Although he bypassed the input of female musicians (which Byrne recently apologized for doing), he recruited an impressive backing band that includes some fast-rising British artists, like 2017 Mercury Prize winner Sampha, Blood Orange's Dev Hynes, and Leeds producer Happa. Although Eno helped Byrne lay down the groundwork of American Utopia's ideas, via drum tracks, it was the input of his friend Mattis With, of the London-based Young Turks label, that steered Byrne to collaborators he didn't know, like Oneohtrix Point Never's Daniel Lopatin, who co-wrote and produced American Utopia's bristling soundscape "This is That" and the wiry, atmospheric "Here." Added production ideas came via XL Recordings' in-house producer, Rodaidh McDonald, and Byrne's frequent in-studio compadre Patrick Dillet. Byrne has never been a particularly confessional, romantic, or revealing songwriter; he revels in the articulation of ideas and sussing out a cultural mood. But American Utopia, even with its lyrical loquacity and busy kaleidoscope of angular rock, salsa, electronic sizzles and sighs, Afrobeat, and whimsical art-pop, feels surprisingly intimate. While still shying from anything that veers too much to the autobiographical, American Utopia candidly reflects Byrne's state of mind during a chaotic period of sociopolitical upheaval — a man seeking an elusive narrative to a world in constant flux. 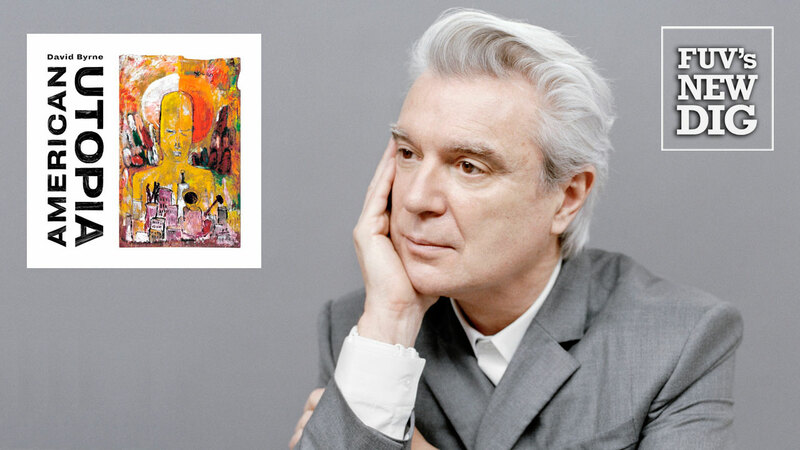 Listen to Rita Houston's conversation with David Byrne, recorded at the Sonos store in Soho, New York, in the FUV Archives and also broadcast on March 29 at 7 p.m. EDT on 90.7FM.